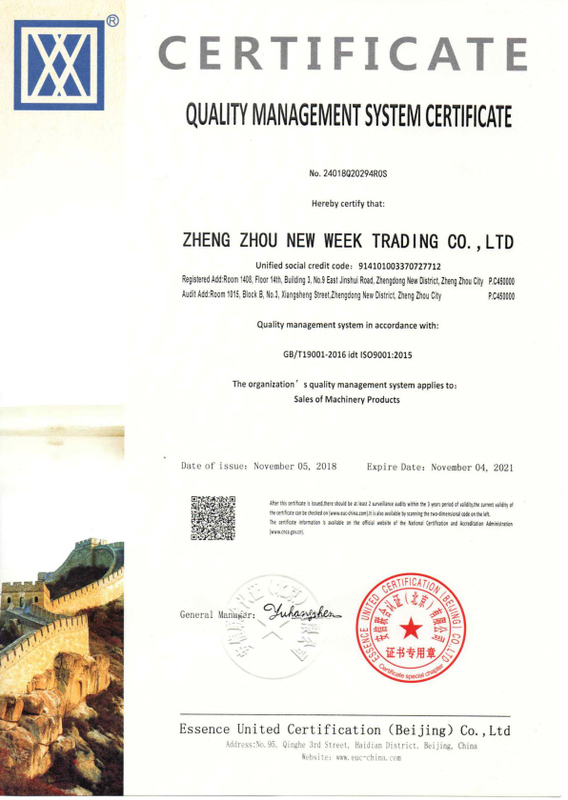 Company Overview - Zhengzhou Neweek Co., Ltd.
Zheng Zhou Neweek Company is a professional exporter of agricultural and food machine. Agriculture machine like corn sheller, rice mill, grass chopper and cutter, barley sprouting fodder machine,sliding table saw, animal feed pellet machine,flour mill,etc; food machine like stainless steel crusher, food drying machine,vegetable washing and peeling machine,cooking pot,colloid mill peanut butter machine,etc.We are located in Zhengzhou, center of china, with convenient transportation access. All of our products comply with international quality standards and are greatly appreciated in a variety of different markets throughout the world and currently export 70% of our production worldwide. Our excellent quality control throughout all stages of production enable us to guarantee total customer satisfaction. As a result of our high quality products and outstanding customer service, we have gained a global sales network .If you are interested in any of our products or would like to discuss a order, please feel free to contact us. We are looking forward to forming successful business relationships with new clients around the world in the near future.